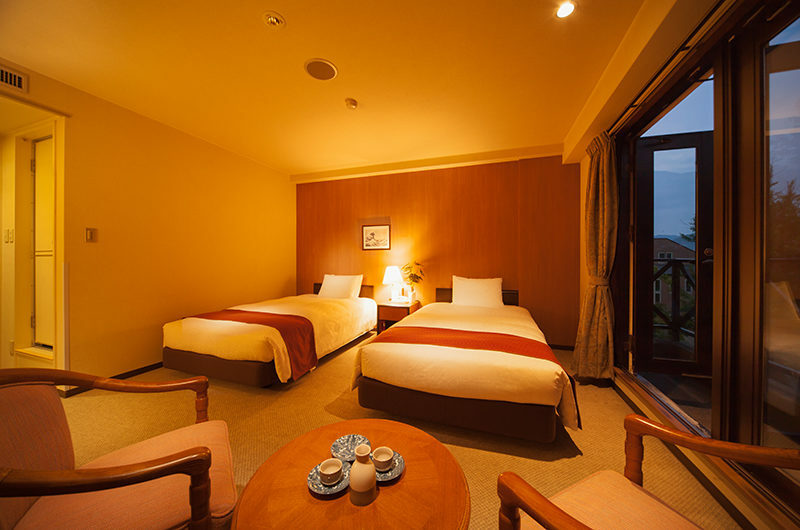 Hakuba Springs Hotel is a soothing escape from reality despite its central location in the heart of Happo Village and the Hakuba parkland. 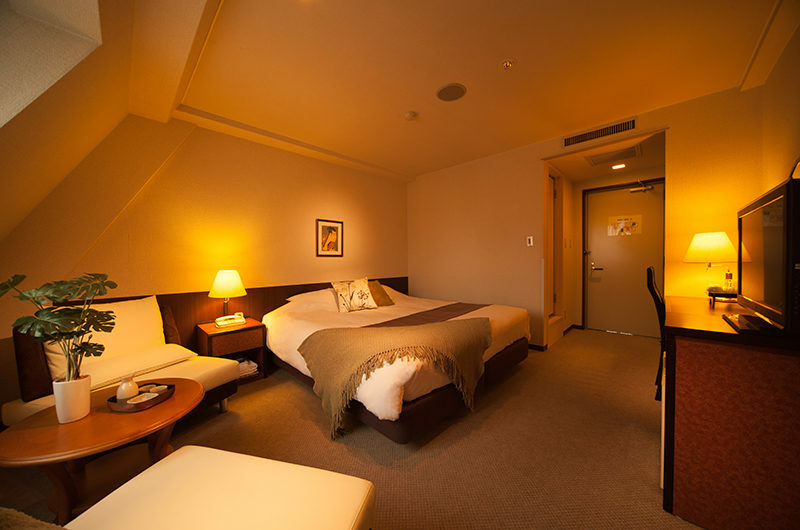 Surrounded by bright pink sakura cherry blossoms in the spring and the finest Japanese powder all throughout the winter, Hakuba Springs Hotel delivers and authentic experience with fantastic hospitality and comfortable guest suites and rooms. 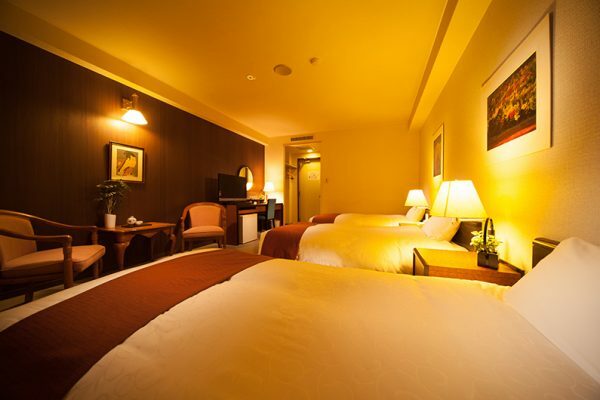 This hotel offers excellent value for money, and while it’s not a boutique/luxury accommodation option, it boasts large rooms with plenty of useful facilities. All of its 35 rooms are fitted with a mini bar, refrigerator and microwave, and hot drinks can be made at any time as well. 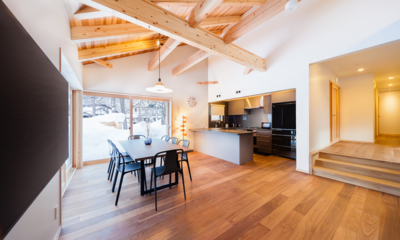 Enjoy the Hakuba Springs house restaurant and bar in the evenings, along with a wide range of choice for breakfast the following morning. 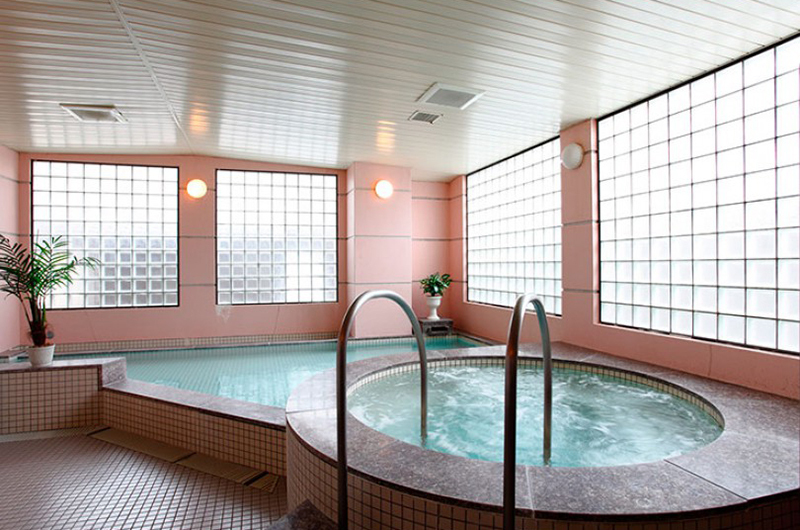 Another wonderful benefit is the in-house onsen, or traditional Japanese hot spring bath. 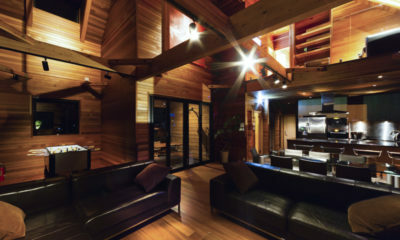 At the end of a long day skiing or snowboarding in Hakuba’s stunning backcountry, there’s no better way to relax, and for many, an onsen experience is absolutely something to tick off the list of any Japanese ski adventure. 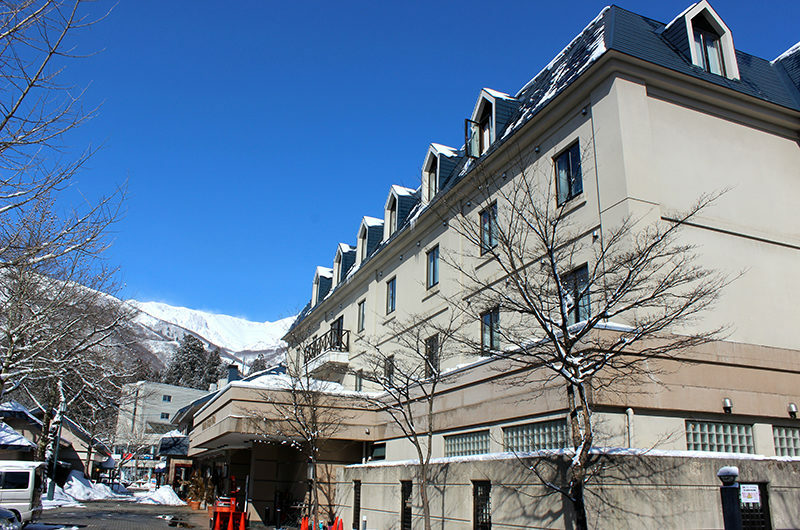 The alkali water content of the Hakuba Springs Hotel Onsen is particularly favoured by locals and holidaymakers alike, and the water comes directly from the areas natural hot spring reserves beneath the ground. A range of further amenities are on offer to guests, including laundry service, babysitting and childcare, airport transfers and anything else that the English speaking concierge can help with. 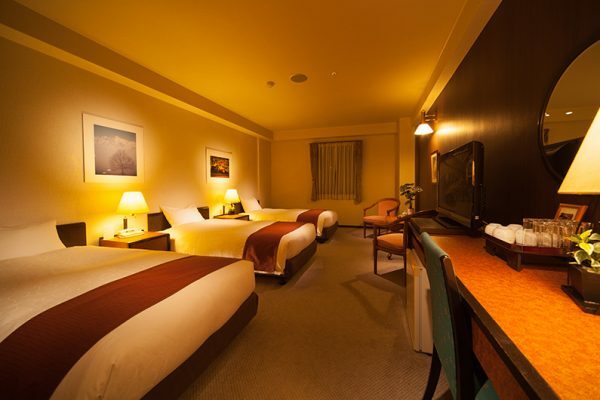 Hakuba Springs Hotel offers a number of different sleeping arrangements to cater to all kinds of holiday making groups of family or friends. 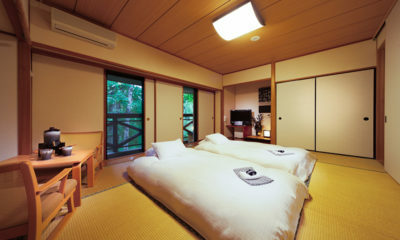 The Jr Suite Room is an excellent option for families of up to five people – with two Western-style twin beds along with a “tatami” area that can comfortably sleep three (tatami is the name given to a more traditional, Japanese sleeping format, which includes the laying of futon bedding directly onto woven bamboo matting). 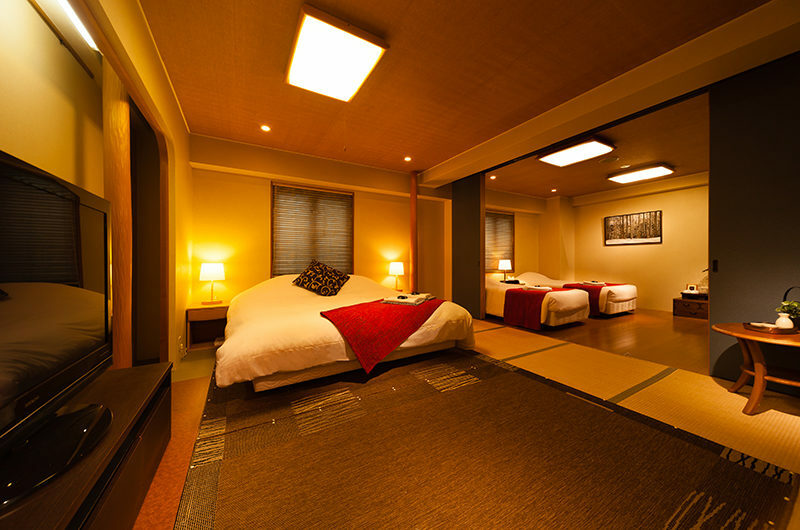 For those wanting a really authentic experience of Japanese hospitality, a straight Tatami room can sleep up to four people. 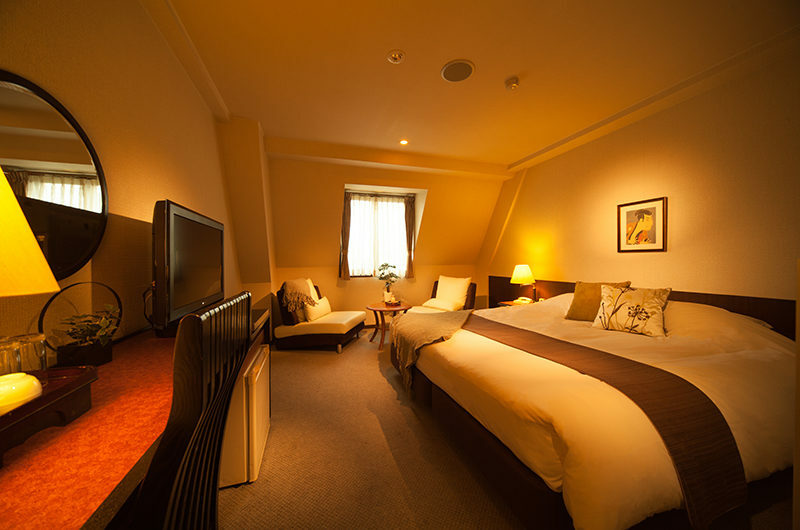 A triple, a standard twin and a deluxe twin room option are all available also, as well as a King Room which features a full-size Western-style bed. There are 12 of these rooms across the hotel. Up to two guests can sleep in either two single beds, or those beds can be joined together for one king double bed. There is a TV & DVD player, with DVDs available at the front desk. The en-suite bathroom is a capsule unit with shower and bath, toilet and vanity stand. The Japanese style room has traditional Japanese tatami straw mat flooring. The room sleeps two guests on futon mattresses, and an additional guest can be added with extra bedding for an additional price. 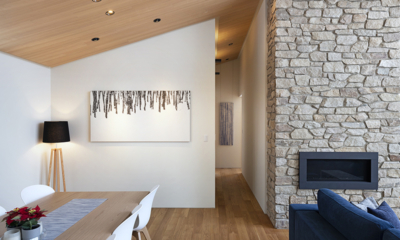 Traditional Japanese artwork decorates the room, and the window looks out towards the mountains of Hakuba Valey. En-suite is a capsule bathroom with bath and shower, toilet and washstand. Step a level above the standard rooms with your own sofa lounge with coffee table, and a luxurious king size bed. There is a LCD TV with DVD player, ample storage space, a table and desk for your use. En-Suite is a unit bathroom with shower and bath, toilet and washstand. 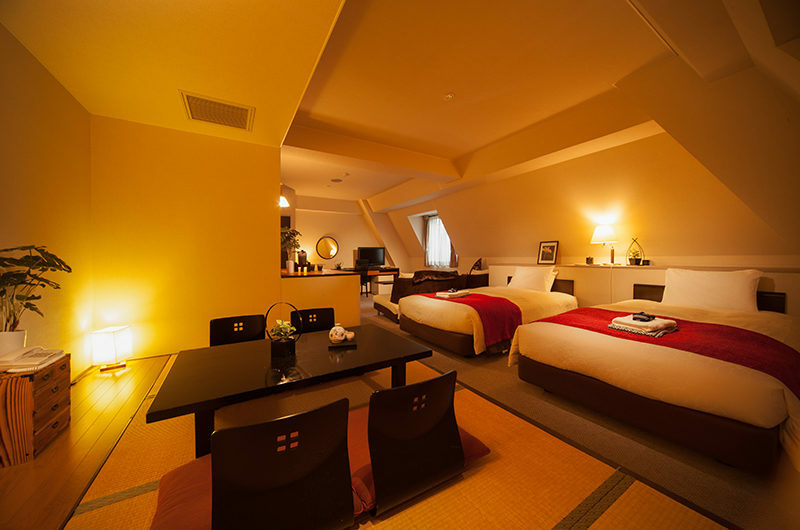 There are 3 rooms available in the hotel in this setup. 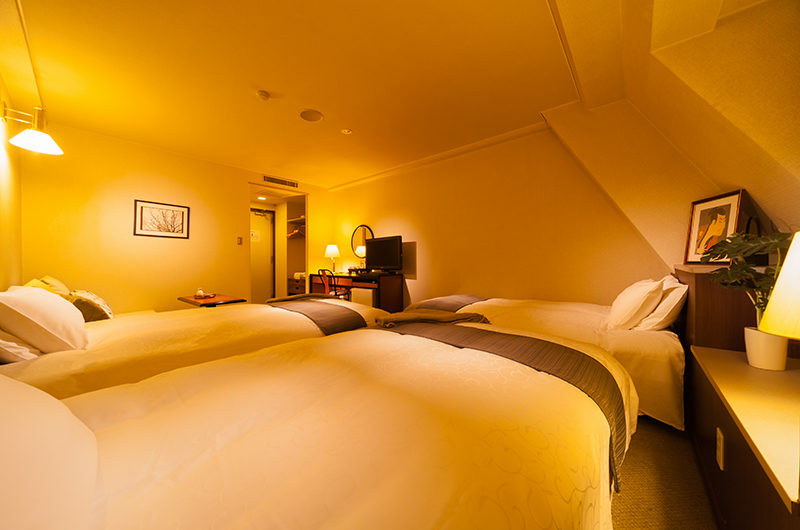 Two guests sleep in either two single beds, or the beds can be joined together to make a king double bed. 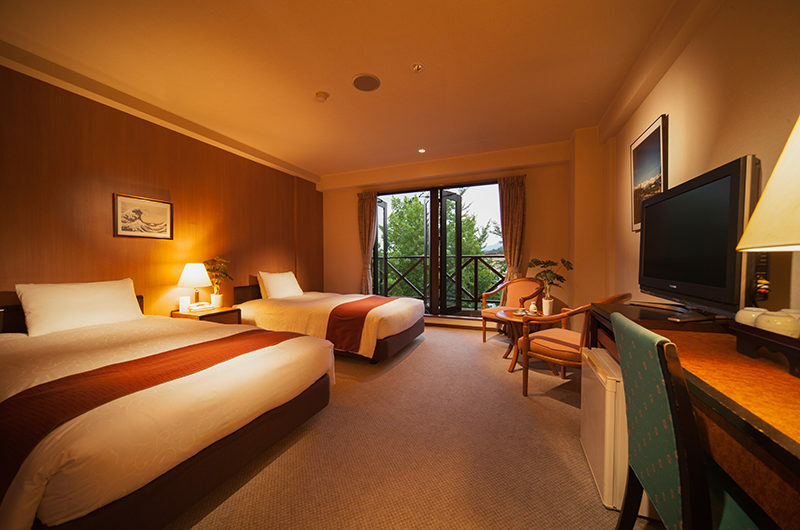 There is a small seating area, and beautiful views – some rooms have a small balcony too. En-suite is a unit bathroom with bath, shower, toilet and washstand. There are three single beds, two of which can be combined to a king double. Three guests sleep in existing bedding, and there is enough room to add an additional guest to the room with additional cost. 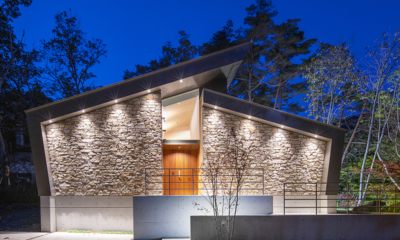 There are tables and chairs, an LCD TV with DVD player, and plenty of storage space. En-suite is a unit bathroom with bath, shower, toilet and washstand. 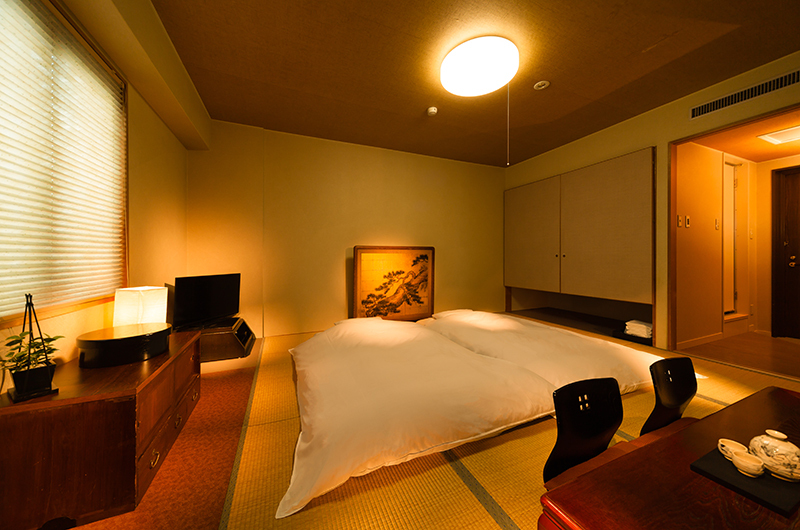 Combining East with West, the Junior Suite room features both western and Japanese style areas. The traditional Japanese section has tatami straw mat flooring, with a traditional low table and chairs, that can be packed away and replaced with two futon beds when it’s time to sleep. 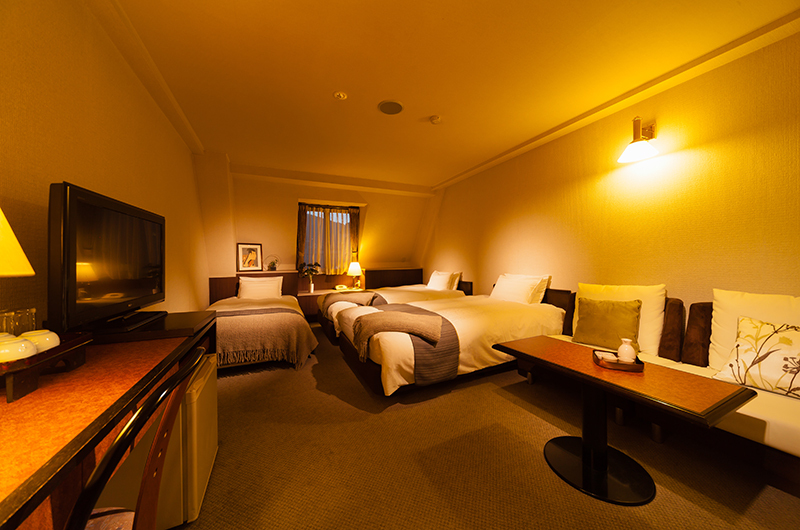 Two western style single beds can be arranged as one double bed. 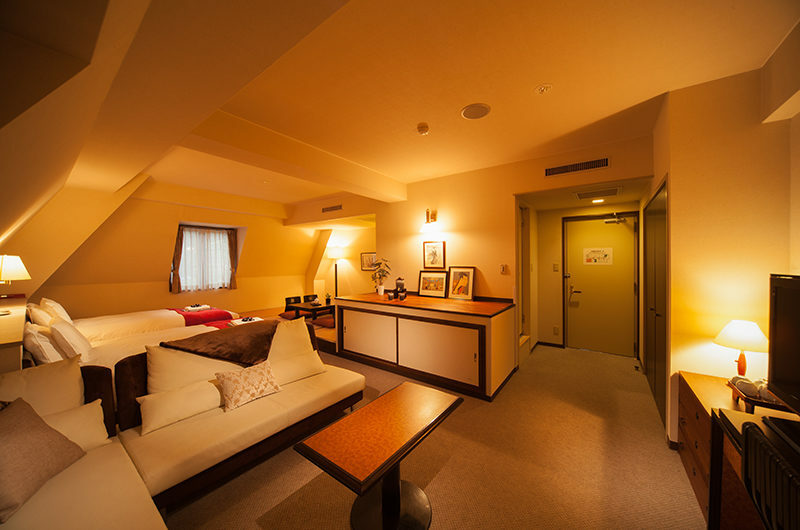 There is a spacious lounge area with sofas and a coffee table, an LCD TV with DVD player. En-Suite is a unit bathroom with shower, bath, toilet and washstand. An additional guest can be added on futon bedding at an additional charge. Perfect for families, the Family Suite sleeps four guests in one king double and two single beds, with an additional guest sleeping in extra bedding for a maximum of five. The room can be separated with sliding doors or kept connected, with sofa seating in each side of the partition. 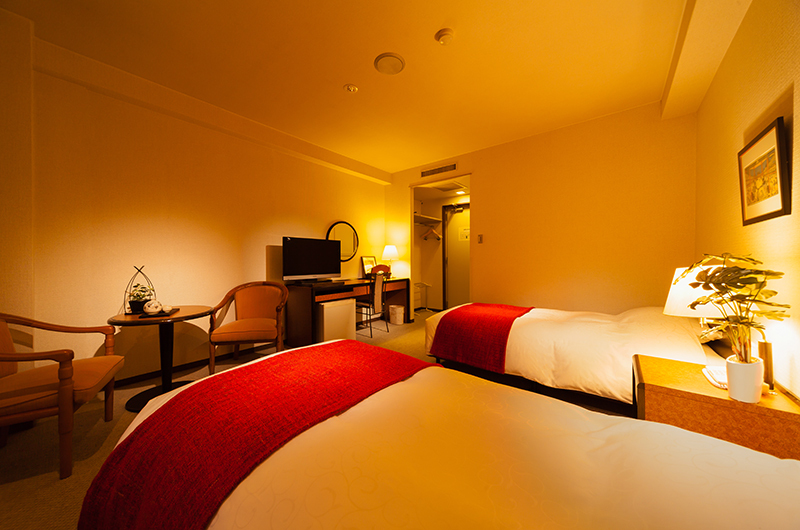 The single beds can be connected to make one more king double bed. 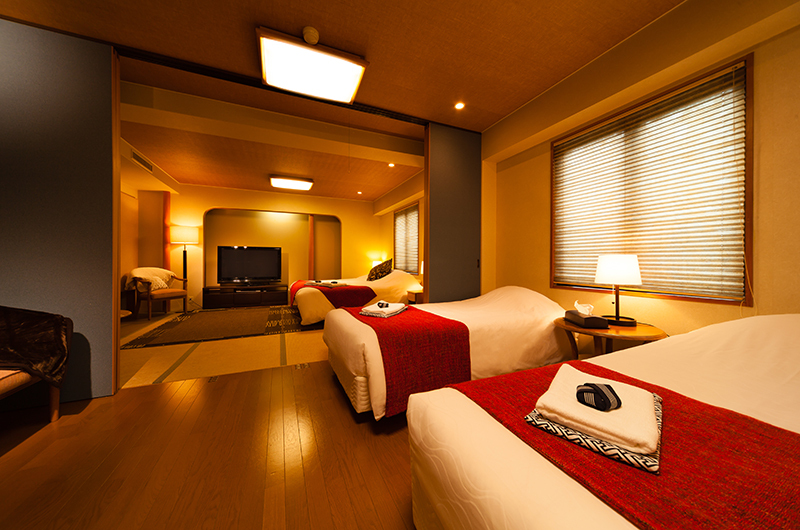 There is an LCD TV with DVD player, with a DVD library at the front desk at your disposal. The en-suite bathroom is a unit with shower and bath, toilet and washstand. 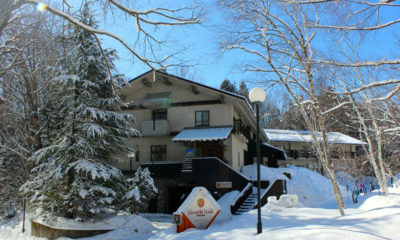 Hakuba Springs Hotel is located in Happo Village, close to the Happo-One ski resort and gondola. 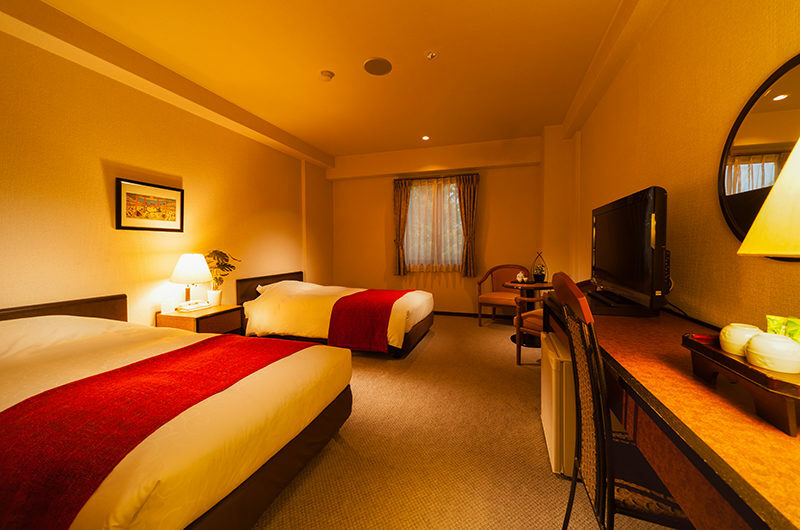 In the middle of the Happo downtown, there are many hotels and guesthouses, restaurants and hot springs within easy walking distance. The Happo bus Terminal is a short 250 metres away, with regular free shuttles leaving for Happo, Cortina and Tsugaike resorts. Hakuba 47’s free shuttle leaves from right outside the Springs Hotel. 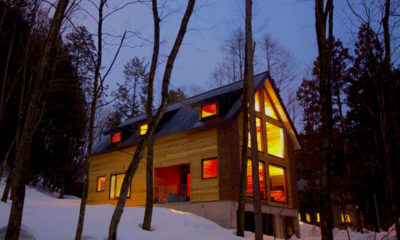 It’s a 20 minute walk to the Happo-One ski resort if you prefer to walk. 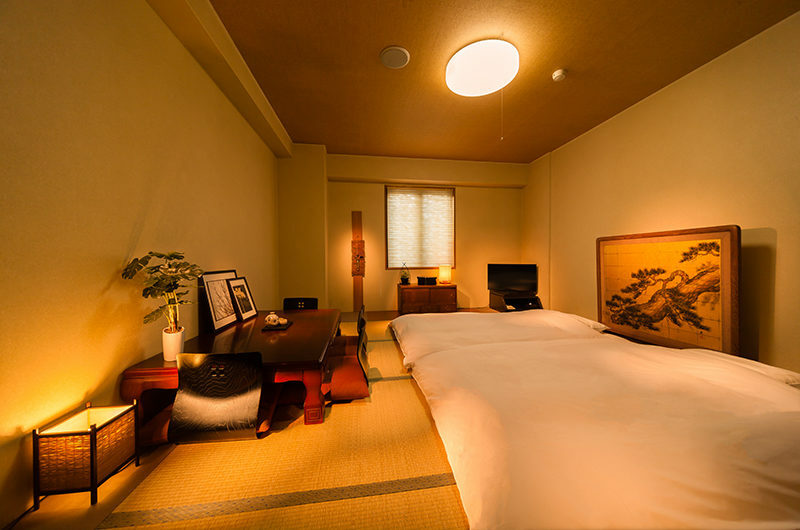 Maeda, Ohyokkuri and Kihachi restaurants are all nearby, as are onsen hot springs: try Sato Onsen for a more traditional atmosphere, or Happo hot Spring for a more modern and clean interior. Stayed at springs for 10 nights with my wife and 3 year old girl. Great location and helpful staff who where fantastic with our little one.. awesome on sight onsen that is bliss after a day on the slopes. Very nice restaurant downstairs although a basic breakfast it had a great menu and tasty dishes for dinner. Would defiantly recommend this hotel. Bus service out the front is very helpful.. thanks girls. I stayed four nights on the tail end of a business trip to Tokyo, and couldn’t have been happier with the accomodations. 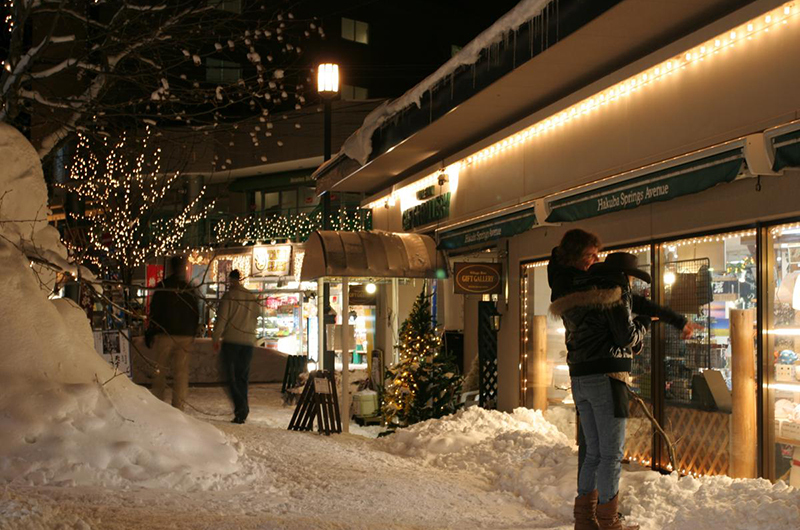 Location is walking distance from the Hakuba-Happo bus station, and walkable to the bottom of the Happo-One lifts and the local ski rental places. The beds were comfortble, the wifi signal was strong, and the climayte control was quite good. The only downsides were a tiny bathroom/shower stall unit, and a limited breakfast buffet. The onsen and ski/boot locker room were cavernous. 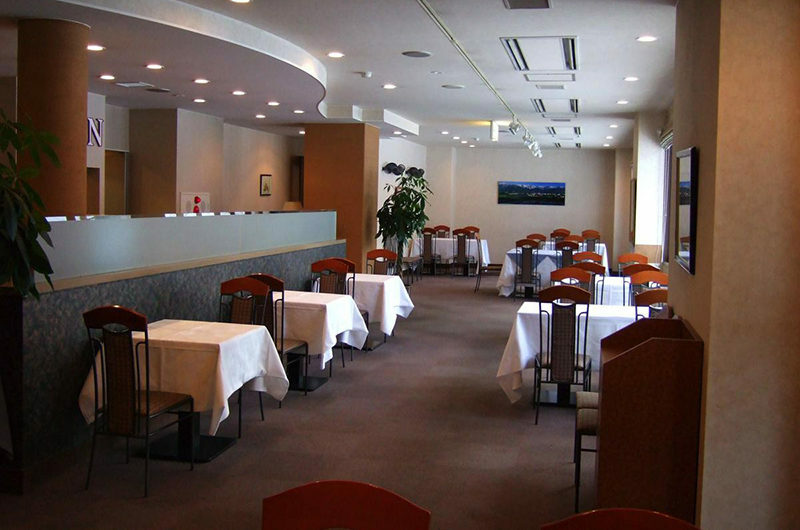 The hotel adjoins a restaurant and bar which are cheap but cheerful. 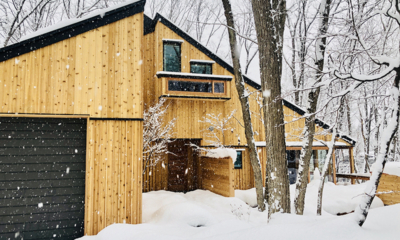 That all said, it was the friendly and helpful staff really made all the difference; their ski tips were right on, they were generous with the hotel shuttle, and were genuinely eager to please. Highly recommended. 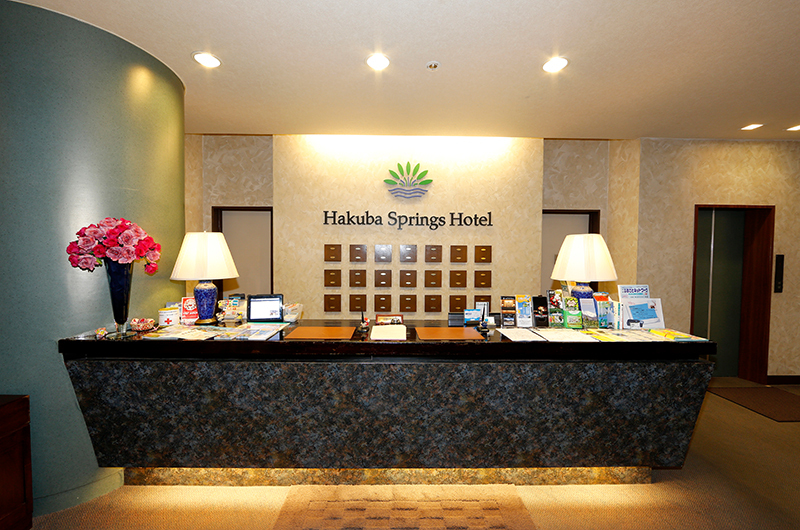 We stayed at the Hakuba Springs Hotel with our two kids. We had two rooms that were very close together. Our room was really spacious and great for when the four of us needed some “inside” time together. I cant rave enough about the service. Mikki on reception was happy every evening to chat about the weather conditions and which ski resort would be the best for us to visit within the Hakuba Valley the next morning. Having breakfast included was very handy and although it was fairly basic it was all that you need to get you ready for the slopes. The hotel is very handy to the bus stops – both the local bus and also the one that takes you further afield. Loved having our own Onsen on the premises. It wasnt too hot which was perfect for my daughter who was new to the experience. We also found that we were in there on our own on a regular basis. The one negative is the tiny bathrooms but it is not enough to reduce the experience. The service makes up anything – it was superb.